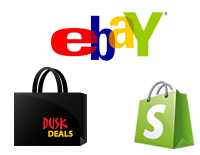 DUSK Deals is a designer discount online store with brand name fashions for men and women at dropping discount prices. All stock is brand new excess merchandise from DUSK. A complete lifestyle boutique, DUSK is inspired by rock’n’roll, tattoo and body modification culture and, above all, art. We look worldwide and locally for the best in creative design and quality products for men and women. There are no seconds, samples, or damaged products. Each item starts with a 10% discount on its original price, dropping by another 10% every two weeks to a maximum of 70% off. Our eBay Store also has amazing clearance sales and auctions with $1 starting bids. Free shipping on orders over $200 in Canada and $15 flat rate shipping to USA, or pick-up your online order at DUSK 552 Queen St. West, Toronto. We ship worldwide.